Litecoin Foundation’s main job is to hire full-time developers for the Litecoin project. We plan to raise 200,000 USD a year to support at least three full-time developers. We have many Litecoin developers who have been working voluntarily on Litecoin part-time for months or years and some are eager to work full-time as soon as possible. One developer costs about 30,000 USD to 60,000 USD per year depending on the developer’s location and experience. The following address gives our donation information. Any amount will be appreciated. Please let us know if you want to keep your name below. 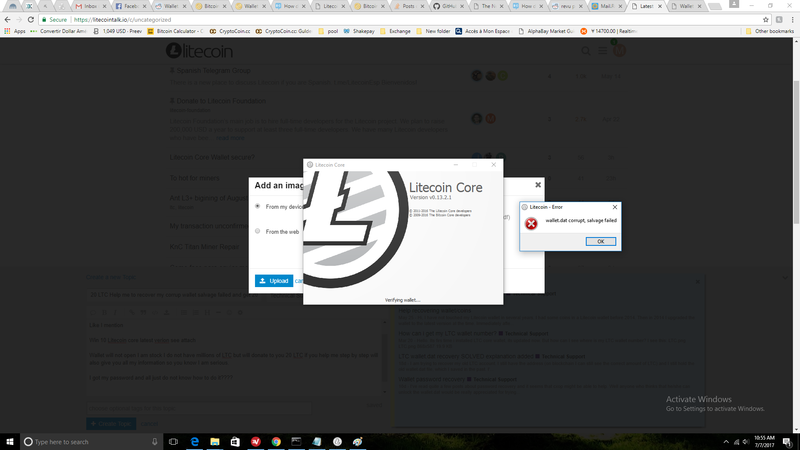 3.23 LTC was sent on behalf of a Peerplays winner from peerplays.com test network! I need someone to help me recover wallet.dat corrupt salvage failed,I know my adress and my password to the qt. I reach out to Chikun no reply yet I can make this annoncement public so you know I am serious. Maybe 20LTC is not much but fir guys like you I think it will take about 1 minute to solve. Hey, can you email us at: [email protected]?